It is often assumed larger birds are more prone to heat stress primarily because of their size. After all, the bigger bird produces more heat than a smaller bird. Furthermore, a large bird has a lower surface-area-to-volume ratio which essentially means it has less square inches of surface area for every pound of heat producing meat, making it more difficult to cool through air movement. Last but not least, a large broiler tends to be better feathered than a smaller bird, hence better insulated than a smaller broiler. Though bird size is an important contributing factor to heat stress, what actually has greater influence is the density at which a bird is grown. The higher the density, the less air movement there will between the birds, resulting in less heat removed from the birds. Furthermore, less air movement around a bird will lead to an increase in the temperature and humidity of the air in the immediate vicinity of the bird, further reducing its ability to lose excess heat. 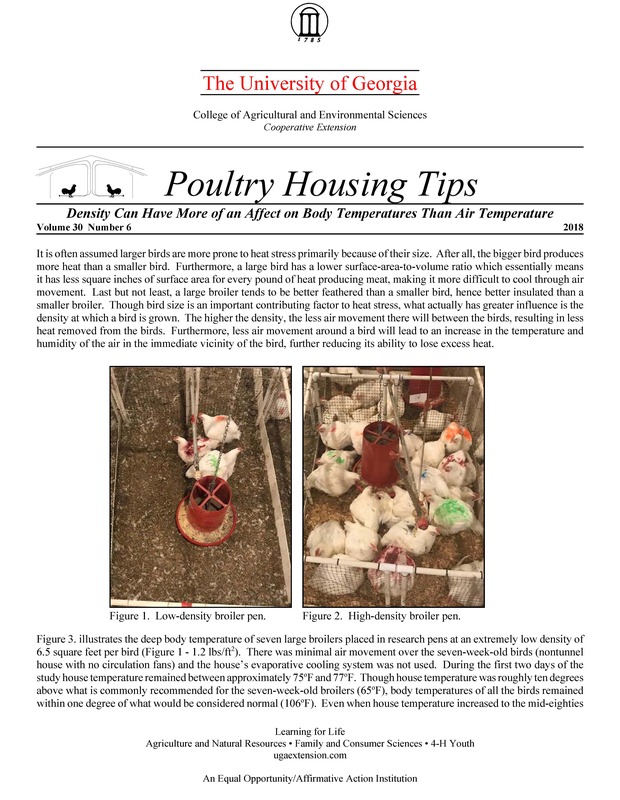 Figure 3. illustrates the deep body temperature of seven large broilers placed in research pens at an extremely low density of 6.5 square feet per bird (Figure 1 - 1.2 lbs/ft2). There was minimal air movement over the seven-week-old birds (nontunnel house with no circulation fans) and the house’s evaporative cooling system was not used. During the first two days of the study house temperature remained between approximately 75oF and 77oF. Though house temperature was roughly ten degrees above what is commonly recommended for the seven-week-old broilers (65oF), body temperatures of all the birds remained within one degree of what would be considered normal (106oF). Even when house temperature increased to the mid-eighties on the third and fourth day of the study the birds’ deep body temperature only increased one degree, with the exception of a single bird whose body temperature increased approximately two degrees. The birds did not exhibit any signs of heat stress during the study and the minor increase in body temperature seen on the third and fourth day of the study would have doubtfully affected weight gain or feed conversion adversely. In an adjacent pen, birds were placed at a commercial density of one square foot per bird (Figure 2 - 7.2 lbs/ft2). Though the air temperature, humidity, and air movement were the same as those grown at the extremely low density, body temperatures were very different (Figure 4). During the first two days of the study when the room temperature was between 75 and 77oF, bird body temperatures were two to four degrees above normal. On the third day when house temperature climbed to 84oF, body temperatures were three to six degrees above normal. On the final day of the study when room temperature reached 87oF, body temperatures were four or more degrees above normal with one bird’s body temperature climbing over 114oF before it succumbes to heat stress. As you might suspect, weight gains over the study period for these birds were half that of those grown at the very low density of 6.5 ft2/bird. It is interesting to note that there was not a very strong correlation between body temperature and bird size. Though Bird 1 and 2 weighed essentially the same (7.5 lbs, 7.4 lbs) Bird 1 had one of the lowest body temperatures of the group, while Bird 2 one of the highest. Though it would be expected that Bird 4, being the lightest bird (6.7 lbs), would tend to have one of the lower body temperatures, it in fact had some of the highest temperatures on the third and fourth days of the study. The relative poor correlation between bird size and body temperature points to the fact that an individual bird’s body temperature is affected by a variety of factors, not just size. These factors include growth rate, feed consumption, feather coverage, and genetics, to name a few. But in this study it wasn’t bird size or any of these factors that was the primary cause for the highly elevated body temperatures, but rather density. Does this mean that birds cannot be grown at traditional commercial densities during hot weather without experiencing dramatic increases in body temperatures and/or equally dramatic reductions in performance? Of course not. This study was conducted without the level of air movement typically experienced in any modern commercial broiler house (600 ft/min+) and without the benefit of evaporative cooling pads (Figures 5 and 6). Numerous studies have shown that with the proper amount of air movement over the birds the bird performance and comfort can be maintained during hot weather while being grown at traditional commercial densities. But what this study does point out is that density can have more of an impact on a bird’s thermal comfort than its size or even house temperature. For example, for the birds grown at the extremely low density, increasing the house temperature ten degrees from 75oF to 85oF increased body temperatures approximately one degree above normal. But at a density of 1 ft2/bird (7.2 lbs/ft2) the birds’ body temperatures were approximately three degrees above normal at 75oF. A argument could be made that even though the thermometer indicated the house temperature was 75oF, the rise in body temperature is more indicative of how the birds would react if the house temperature were well over 85oF had they been placed at a very low density. In other words, density increased the effective air temperature (the temperature the birds perceived it to be) by over 10oF. Again, the study was conducted in a house without the supplemental air movement that would exist in any commercial broiler house, but it illustrates the very important role density plays in bird comfort at essentially any house temperature. 1) Not taking density in to account when determining target temperatures can result in reduced bird performance. For example, the optimal air temperature for a 35-day-old-broiler depends upon when it is going to be sold. If the bird will be processed at 42 days the amount of space around the birds at 35 days will tend to be very low compared to that if it will be sold at 60 days. The reduced space around each bird will tend to result in higher body temperatures compared to those being grown to 60 days, which means a lower house temperature and more air speed would need to be maintained in order to keep the 35-day-old-birds comfortable that are being grown to an age of 42 days compared to those being grown to 60 days. 2) Target air speeds in tunnel-ventilated houses can be more of a function of the density at which the birds are placed than the actual size of the bird grown. It is often thought that air speeds can be much lower in houses growing a 5 lb. bird compared to those growing an 8 lb. broiler. Though an older, larger broiler can more difficult to cool than the smaller bird, the fact is that a 5 lb. broiler produces more heat per pound than a 8 lb. broiler. The reduced space between the birds at the end of the flock can have as much of a detrimental effect on a small bird’s body temperatures, and therefore performance, as it does with the larger broilers. Therefore, the ideal air speed for houses growing small and large broilers may not be as different as many believe. 3) The effect that density can have on the effective temperature for a broiler is commonly seen in tunnel-ventilated houses during hot weather (Figures 7 and 8). Though the air temperatures are lower at the pad end of a tunnel-ventilated house, more times than not the heaviest birds can be found toward the warmer tunnel fan end of a house where the densities are the lowest due to bird migration. Though air temperature at the pad end might be a few degrees cooler than at the fan end the higher bird density at the pad end of a house can make the effective air temperature five degrees or more warmer than for those birds at the fan end of the house. 4) To insure that the effective temperature is the same throughout a house migration fences should be installed year-round. Though bird density differences tend to be most problematic during hot weather, bird density can have an significant effect upon a bird’s thermal comfort when house temperatures are only in the seventies. So though the controller’s sensor may all be within a degree or two the fact is that if there are differences in density within a house, differences in effective temperature could be far greater than the sensors indicate. To help manage bird density uniformity migration fences should be placed roughly every 100' and installed by the time the birds are two weeks old. 5) The higher the density (lbs/ft2), the less representative environmental controller temperature sensors are of air temperature perceived by the birds. When there is a lot of space around the birds there is typically a minimal difference in air temperature a couple of feet above the floor from that at bird level. But as bird density increases toward the end of the flock and the amount of air movement between the birds decreases, the air temperature and humidity between the birds will tend to be higher than it will be just a couple of feet above the birds. The higher the density, the greater the difference between what the controller indicates the house temperature be and that perceived by the birds. 6) To create an accurate wind speed “cooling effect” curve, not only would bird age and house temperature need to be taken into account, but bird density as well. The higher the bird density, regardless of age, the lower the amount of cooling produced at any air speed. 7) The high air speeds common in modern tunnel-ventilated houses has enabled producers to grow broilers at densities during warm weather that would otherwise be impossible. Without the benefit of the air speed and evaporative cooling that exists in a modern commercial broiler house densities, would have to be dramatically reduced to keep birds comfortable during even moderately warm weather. In fact, based on bird weight gain data collected in this study, bird density would likely have to be cut in half.